The Healthy Food Environment Initiative reaffirms our commitment to creating a healthy, sustainable, environmentally friendly food environment for the ZSFG Community. Promoting healthy food and nutrition is fundamental to the effective treatment and care of ZSFG patients as well as the wellbeing of its staff and providers. Our Garden Giveaways program, student interns and volunteers work with hospital gardeners to harvest and distribute hospital-grown vegetables and herbs to participants in hospital-based chronic and acute disease management groups as well as participants in the hospital’s smoking cessation program. The vegetables and herbs are accompanied by relevant recipes in English and Spanish. The mission is to provide fresh organic produce to patients and their families in order to inspire an incorporation of vegetables into their daily diets. All produce that is shared with participants are grown locally in one of our many onsite ZSFG raised garden beds. Learn More! Affordable produce is here! 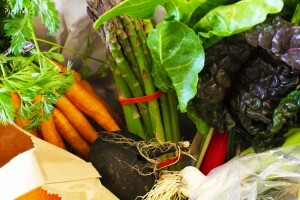 The Community Wellness Program has teamed up with Imperfect Produce to provide affordable CSA options for our community! Learn More! We offer monthly classes in our Wellness Demonstration Kitchen (in the Community Wellness Center) where participants have an opportunity to learn about new foods and easy, fresh recipes. When in season, participants can also take home produce from the campus gardens through our Garden Giveaways program. The classes include simple tips for breakfast, lunch, and dinner. Other topics discussed in the classes include hydration tips, label reading for hidden sugars and salt, cooking with spices, and preparing soups and stews. Learn More! Food trucks are bringing their flavorful fare to ZSFG Monday-Friday from 11:30am-2:30 pm! A different truck serves food in the 23rd St parking lot near Hearty Cafe. Take advantage of this tasty delight! Learn More!